OK – I’m officially freaked out – vid of Stevo’s cousin! The first Terminator has always been one of my fave flicks (1). A killer robot intent on changing the future by changing the past really got my attention. Arnie was über-cool and Linda Hamilton was pretty hot. Now, in 2009, 2029 is only 20 years away but still… pretty far-fetched, eh? Which brings me to what has freaked me out. 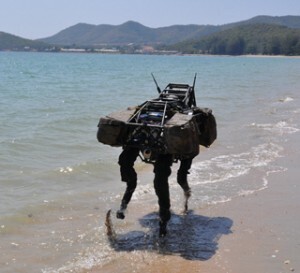 Boston Dynamics is a small engineering and robotics firm spun off from MIT in 1982. According to its Web site it “builds advanced robots with remarkable behavior: mobility, agility, dexterity and speed.” Mostly military applications: the US Army, Navy, and the Marine Corps. You might remember their robot dog a couple of years back. Cute little thing that didn’t pee in the corner and would do as told all of the time. This is the first generation of the machine. What will Version 15.0 lo0k like? And does Stevo have plans to create a body-double? 1. It’s likely tied with Predator – the only movie that I know of that starred not one but TWO future Governors!